it has caused a severe drought in Australia and Papua New Guinea. It has led to a famine in South Africa. Hurricanes in Mexico are said to have been caused by this phenomenon. Floods in Peru are due to its movements. It has fuelled the forest fires in Indonesia and the Amazon. It has affected marine and wildlife. It has killed thousands and has rendered millions homeless. Ironically, it is the "Christ child" which is causing all this devastation. El Nio, which means "the little one" in Spanish was first recognised by fisherfolk off the coast of South America as early as the 19th Century. A warm current in the eastern Pacific brought in its wake the inexplicable death of thousands of fish. Since it normally became optimal around Christmas they called it the Christ child. The tiny micro-organisms which fish depend upon for food, were the first to die. The fish followed suit. Sharks retreated to the bottom of the ocean where the temperature was cooler. But worse was to follow. Devastating rainstorms and floods would become the order of the day. In some areas the rains would cease and wind patterns could turn green pastures into deserts. Scientists today believe that the Atacama desert in Peru is the result of atmospheric activity associated with El Nio. In some regions there would be more than abundant rainfall. The rainforests of Borneo and Indonesia are supposed to owe their existence to this phenomenon. Social behaviour and eating habits of animals are also affected: from mating patterns between sea lions to eating patterns for marine iguanas, to the death of penguins and other flightless birds by starvation. Cropping patterns also do not escape the wrath of El Nio, whether it is the corn harvest in Zimbabwe or the rice bowl of Asia. 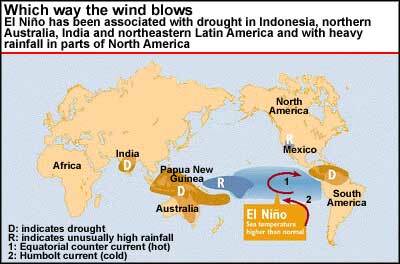 The weather patterns created by El Nio threaten food supplies in many Asian and Pacific rim countries. Already a drought grips most areas of Southeast Asia and threatens to bring down the production of commercially important crops like coffee and palm oil. Mining activity dependent upon hydroelectric power has been suspended and weather patterns linked to El Nio could lead to a decline in the wheat yield in Australia which is at present leading to bushfires there. Misinformation about the phenomenon could also end up costing businesses and consumers a lot of money in terms of cancelled vacations, a drop in tourism and even speculation on energy pricing in the hope of a mild winter. El Nio winters on the contrary can be brutal. Satellite imaging and data gathering computers have shown that the tentacles of El Nio spread from the Pacific to vast areas in Australia, Africa and Asia which become susceptible to drought. In the North American continent specially from California to Florida heavy torrential winter rains can be expected. Memories of the arid tornadoes and torrential winter rains caused by the 1982-83 El Nio are still fresh in the minds of residents of southern California. Warm conditions have persisted in the tropical Pacific since July 1997. According to the World Meteriological Organisation ( wmo ), sea surface temperatures throughout the equatorial east-central Pacific increased during April and May, when temperatures normally decrease in this region. During August and September ocean surface temperatures reached near-record levels in many sections of the equatorial Pacific. Temperatures increased by four degrees along the Equator east of 120 w and increased by five degrees near the Galapagos Islands along the coast of northern Peru. Exotic warm water species of marine life such as the swordfish have been found as far north as in the state of Washington. Much to the delight of anglers a 130 kilogram goldfish was caught in Seattle and giant rainbow-striped anchovies and crabs are adding to the quality of the fishing there. This delight is not mirrored in California where mass hysteria with regard to El Nio has gripped the populace at large which is readily lapping up quick-fix remedies promoted by unscrupulous marketing agents. As Californians prepare for an unusually brutal winter the demand for roofing material like gutters has gone up by more than 20 per cent. Manufacturers are doing roaring business in the selling of roof repair products. According to Michael R Smith, the president of Weather Data Inc. a weather forecasting company located in Winchita in Kansas in the us , the situation has gone out of hand. "This is the best publicised potential disaster in history," he says. "People are drawing a very close parallel to 1982-83," he adds. "Some of the precautions like cleaning out flood control channels will pay off handsomely if there are problems," he nevertheless concludes. Meanwhile, the weather is still dry. This presents dry condition means more wine. Wine lovers are definitely not whining over El Nio, nor is anyone in Bordeaux in France, where the empty bottles are now in short supply. As things stand the world is soon going to be divided into two groups, those who benefit from El Nio and those who don't stand to benefit from it. The President of Peru, Alberto Fujimori, has cast off his bullet-proof vest after having disposed off the terrorists at the Japanese embassy. He has now decided to take on "the little one" to boost his sagging image. Construction work is in full swing reinforcing the nation's dams and bridges as Peru prepares for a showdown with nature. There is also a growing realisation that El Nio's adverse effects on the sugar crop will be limited in the current crop cycle. According to the International Sugar Organisation in the uk , the unseasonal rains have only marginally affected Australia's sugar crop. On the other hand, the phenomenon is expected to boost the yield in Brazil's north and northeast region bringing prosperity to Brazilian farmers. It is also hoped that the weather conditions will benefit farmers in the Philippines. While there is bad news for cocoa farmers in Malaysia and Indonesia, the output of these countries is meagre compared to the Ivory Coast. Merrill Lynch in its commodity market trends report has stated that rain after a long dry spell in the Ivory Coast could lead to a bumper cocoa crop more than offsetting the losses sustained in these two countries. While the Christ child has brought luck to Australian fisherfolk resulting in a bumper tuna catch, it has meant bad luck to Papua New Guinea where the catch has been much lower. Sea water temperatures that normally range between 23 c to 29 c have climbed to 37 c forcing many fish to migrate north in search of cooler water. The western Atlantic and Caribbean have also been uncharacteristically quiet in view of the fact that it has been dubbed the "hurricane alley". The eastern Pacific, however, has seen heightened storm activity. The full picture is yet to emerge. According to Glenn McGregor, climate expert at the University of Birmingham's school of geography in uk : "The current El Nio is still in its early stages. It's certainly some months off its peak." That El Nio definitely means good fortune for some is evident from the satisfied smiles of futures brokers who operate in the commodity market. Coffee futures soared and dropped creating ripples of hysteria in the market. A few days ago coffee beans were worth their weight in gold in the international market. Now that it is raining in Sumatra they are worth just beans. scientists have been struggling to come up with conclusive answers on the extent of damage El Nio would cause on the entire world. Since March 1997, they have been observing significant warming of sea-surface temperatures in the Pacific Ocean, off the coast of South America. The phenomenon usually peaks around late December and is often associated with important changes in temperatures and precipitation, which may positively or negatively affect agriculture and water resources. The change in sea surface temperatures also affect marine ecosystems. El Nio has occurred twice in the last fifteen years. 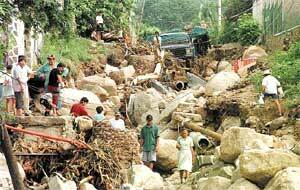 In 1982-83, El Nio caused severe flooding and extensive damage in Latin America and drought in parts of Asia. In 1991-92, the effects of El Nio led to a severe drought in Southern Africa. Scientists believe that this year's El Nio will be the most severe this century. Meteorological organisations around the world also indicate that this phenomenon will continue throughout 1997 and possibly extend into 1998. The worst effects of El Nio are expected to be felt over the next few months. In recent months the fao's Global Information and Early Warning System has been closely monitoring weather anomalies and assessing the possible damage these may cause on crop production and the food supply. Researchers working at the fao have observed significant deviations in weather patterns in Asia which they say is a cause for concern. Cambodia is witnessing serious weather anomalies affecting agriculture. Heavy rainfall and floods have affected the early rice crop in several parts, specifically in Kratie province in the east. The 1997-98 target for paddy production has been set at 3.6 million tonnes, slightly higher than estimated output of 3.39 million tonnes in 1996-97, from an area of 2.17 million hectares. China experienced its worst drought in 20 years in July and August. This is seriously affecting crops, particularly in the provinces of Henan, Hebei, Shanxi, Hubei, Liaoning and Jilin in central and north eastern parts of the country. Officially, it is estimated that up to two-thirds of the country has been affected by prolonged dry spells. In the central and southwestern regions drought conditions continue to affect some 3.1 million hectares of crops along the upper and middle reaches of the Yangtze river. This may affect the autumn harvest. But unseasonal rains have improved conditions for planting winter wheat, normally sown from the second half of September, in central parts of the country. The current drought in Indonesia is reported to be the worst in half a century. For the remainder of 1997 and into 1998, dry conditions are predicted to continue over southern Sumatra and Kalimantan, on the Island of Borneo, Java and eastern parts of the country. In these areas, although monsoon rainfall normally begins in September the first rains only came in November. The impact of this will be most noticeable in the second season of rice and maize in Java, the country's largest producing area. It will also affect soil moisture conditions for maize planting in November and December in eastern parts of Java and southern Sumatra. Insufficient rainfall and dry conditions may also affect the output of coffee in key growing areas of Lampung and Benkulu in south Sumatra, cocoa and rubber. Overall, official estimates indicate that the drought would affect some 300,000 hectares of rice. Prevailing dry conditions have also exacerbated the forest fires which have affected agriculture and forest plantations and reduced water supplies. In August and September, there have been various reports of falling water reserves in wells and rivers in parts of Sumatra and Java. In North Korea the prolonged drought has worsened. This is expected to have serious and far reaching repercussions on the country's already grave food supply situation in the year ahead, especially as its population has already been severely affected by a shortage of food over the last two years. Although the 1997 season began favourably with rainfall appreciably above normal in May, subsequently precipitation fell sharply. Consequently, rainfall in the critical months of June, July and August fell to between 20 and 30 per cent of the long term average. Crops were also adversely affected by significantly above normal temperatures at critical stages of growth. The food outlook for North Korea in 1998 is worse. Domestic production of cereals, even under the most optimistic scenario, will meet less than half the country's minimum food needs, whilst imports are likely to become increasingly strained due to growing economic difficulties. Further, as imports last year were highly dependent on barter trade with neighbouring provinces of Jilin and Liaonning in China, the fact that the drought this year has seriously affected crop production in these provinces too, may reduce surpluses and the volume of trade next year. This, therefore, may exacerbate food problems. Malaysia, which suffered the haze from forest fires in Indonesia due to El Nio's induced wind patterns, has had below normal rainfall. But, coffee, cocoa and sugarcane crops are reported to be in a satisfactory condition so far. However, in areas affected by severe dry conditions, production is predicted to decline. The government had to declare a state of emergency in eastern Sarawak due to the haze emanating from forest fires in Indonesia. In the Philippines, various parts of the country have been devastated by the worst drought in years. In northern parts of the country, rainfall has been below normal since May affecting major rice and maize growing areas. Elsewhere, large portions of the country, including eastern Luzon, Visayas and Mindanao, experienced little rainfall throughout August and the number of tropical storms across the country, which bring significant amounts of rainfall, has been fewer than normal. In October this year, hurricane Pauline in Mexico tore apart houses, washed out roads and killed around 230 people. Again in November, another hurricane, Rick struck the southern coast of the country. Hurricane Rick did little damage, compared with the destruction caused by hurricane Pauline and no deaths were reported. In the Chiapas region, flooding of the coast in upland river valleys, has been saturated by three previous storms. The hurricane season in Mexico has been particularly intense, which some blame on El Nio. In Papua New Guinea the government declared a state of emergency in response to a devastating drought, the most serious in over fifty years, allocating us $14 million in aid to 19 of the country's 20 provinces as concern over food shortages increases. In the coming months, there is going to be a shortage of water, both for agriculture and for human consumption. Large numbers of people living in the mountains , who rely on home gardens, are reported to be deserting villages in search for food as drought has resulted in widespread bushfires destroying homes, crops, grasslands and forests. Rivers and dams have also been severely depleted in highland areas, which have been the worst affected by a combination of four months of drought and serious frosts. The areas most affected include Enga and southern and western highland provinces, where extensive damage to the sweet potato crop has left the communities with severely reduced food supplies and planting material. These regions are also the most vulnerable to food shortages as there are limited alternative foods available and no cash crops to generate income. In addition to these areas, communities in the upper Fly River, especially those around Kjunga, are experiencing difficulties in meeting food needs as the main river supply line is no longer functioning due to the drought and seriously reduced water levels. Although there is a possibility of some rainfall later in the year, overall serious drought conditions are likely to continue till December or January 1998 and possibly March. The food supply and water situation, therefore, is likely to deteriorate significantly. So far official reports indicate that between 700,000 to one million people have been affected by extreme weather conditions and face food shortages. Unconfirmed reports indicate that the country's 1997 coffee crop, a key export item, will be reduced by up to 50 per cent by the drought, while damage to cocoa and palm oil is also expected. In Australia, a severe drought threatens the livelihood of thousands of farmers. According to the wmo , the region has been very dry since June, with large-scale wildfires and drought. many areas have already experienced rainfall deficits of 400-500 mm (16-20 inches) in the last several months. Due to the shortage in rainfall, thousands of cattle have starved to death. In many areas farmers are abandoning their farms and are coming to the cities in search of employment. Africa is also facing the wrath of El Nio. The southern part of west Africa received abnormally low rainfall since July. wmo says that the region also received an extended period of suppressed rainfall during the 1982-83 El Nio. The onset of the rainy season has not begun for most of southern Africa. As of the first part of November, eastern Africa experienced abnormally intense rainfall along the coast, and generally higher than normal precipitation. there is still confusion among Indian scientists on whether El Nio will strike India. However, weather experts from the West have predicted severe drought conditions and a shortage of foodgrains in 1998. Despite these warnings, Indian scientists are either ignorant or playing down this effect. Some fear that publicising its effects on India could lead to panic in the market and speculation and hoarding of foodgrains. As yet, western forecasts have not proved true. A forecast issued on June 26 by the us National Oceanic and Atmospheric Administration ( noaa ) had said that India would be drier than normal. Also, Ants Leetmaa, director of the Climate Prediction Center of the us National Oceanic and Atmospheric Administration had said that El Nio would bring drought to India. The Food and Agriculture Organization ( fao ) says that although the overall rainfall situation in 1997 has been normal, poor temporal and spatial distribution of rains adversely affected crops in southern states where reductions in the output of winter foodgrains and oilseeds are expected. As a result, the output of winter grains is expected to be some two million tonnes below target and to fall from 105.1 million tonnes in 1996-97 to around 103.5 million tonnes in the current marketing year. Overall output of rice is projec-ted to increase, by some 1.6 million tonnes, compared to 1996-97, though production of coarse grains and pulses are both expected to fall. The 1997-98 target for rice production, from the kharif and rabi crop, has been set at 83 million tonnes. So far, no alarm bells have been sounded to face an impending crisis. No contingency plan has been worked out to face the calamity. "The last time India had drought was in 1987, which is said to have been caused by El Nio," says Devinder Sharma, who is with the Delhi-based Biotechnology and Food Security, a research institute. The Indian Meteorological Department ( imd), New Delhi, had not predicted that drought. In fact, the government was caught unawares. Nevertheless, it acted quickly.  Preparation of water budgets to optimise the use of water available in the reservoir and utilisation of ground water.  Effective steps to provide drinking water to the drought affected population.  Public health measures and providing supplementary nutrition for the young and the needy children in the drought affected areas. While other countries are taking measures to meet the shortage in food supply, India in the second week of November exported wheat and rice. The government in Ecuador has stopped the export of foodgrains without debating over the authenticity of the prediction. "The government does not even think it fit to appoint a committee of scientists or agriculturists to study the impact of El Nio on India. The government, whenever questioned, takes recourse in the fact the monsoons have been normal and there is no cause for alarm," adds Sharma. Well-known scientist M S Swaminathan while speaking to Down To Earth said that it is difficult to predict whether El Nio will affect India as the Indian monsoon is a very complex phenomenon. However, he says, "Keeping in mind the predictions of the fao and the wmo , the Indian government should be prepared with a contingency plan". Indian weather experts believe that El Nio will have no impact on India. "Despite what the prophets of gloom in the West are predicting, our observations from meteorological centres across the country indicate a normal monsoon," says N Sen Roy, director general, imd . The Indian monsoon has a direct impact on the Indian economy. A normal monsoon has great importance for India, where the agriculture sector accounts for more than 34 per cent of the country's net domestic product. It provides employment to about 64.8 per cent of the country's total work force. imd officials insist quantity and distribution of rainfall in the current monsoons has been normal so far. According to Roy, 29 of the country's 35 meteorological sub divisions have received normal or excess rainfall. Most of the other regions have suffe-red only a marginal deficiency, which could be made up as the season progresses. He explained that the weather pattern is too complex , with far too many variables involved for a simplistic reading of weather to come by. "There is no correlation bet-ween El Nio and the state of the monsoons," experts say. Sources at the imd said that the department had taken the El Nio into account while making the monsoon forecast. "There is no direct evidence to link the Indian monsoon with El Nio and how it affects the crops," says P S Datta, a scientist working with the Indian Agricultural Research Institute, New Delhi. "It is too early to predict whether El Nio will strike India," says S K Dubey, Centre for Atmospheric Studies, Indian Institute of Technology, New Delhi. In his book, "The history and economics of Indian famines (1914)", A Laveday, a British drought and famine expert, wrote that it is towards the middle and the end of each century that most of the calamities have struck India. However, it is to be noted that it is only recently that scientists have linked disasters in various parts of the world with El Nio. Therefore, whether disasters in the past were related to El Nio, remains a debatable question. Richard Grove, professor of environmental history at the Australian National University, who has been doing major research on El Nio, feels that El Nio will have a direct effect on the monsoons in India. 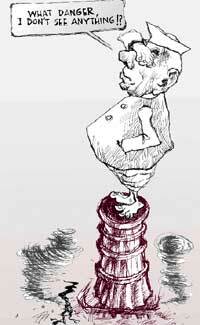 He told Down To Earth in a recent interview: "When you get a strong El Nio, the Indian monsoon fails. You can demonstrate that historically. The biggest famines in Indian history were directly linked with the El Nio effect." At the same time there are a few scientists who see some connection between El Nio and the monsoons in India. D R Sikka, former director of the Indian Institute of Tropical Meteorology in an interview with a fortnightly magazine said that the El Nio effect occurred when the pressures over the Pacific Ocean and the Indian Ocean were out of phase. According to him, whenever the El Nio phenomenon has occurred, 60 per cent of the time India has had a bad monsoon. He says that it, however, has been different this year, and added that "regional or other factors" may have offset the El Nio effect. J Srinivasan, chairperson, Centre for Atmospheric Studies, Indian Institute of Science, Bangalore, says that whenever there was unusual warming or cooling of the east Pacific, global circulation patterns changed and hence rainfall in India was affected. "However", he says, "we are not ready for a conclusive prediction." While it cannot be said that sea warming will produce a serious drought, all the four serious droughts that have occurred in India over the last 120 years have been El Nio years. Though us weather experts have warned that a severe El Nio factor could badly affect the monsoons, Vasant Gowarikar, who is working with the imd and is the creator of the 16-parameter monsoon prediction model in India, rejects this opinion. According to him, El Nio is just one of the parameters taken into account while preparing a long range forecast by the Indian Monsoon Prediction Model. He adds that us scientists consider only three to four factors. Gowarikar believes us scientists have been consistently wrong for several years while predicting the Indian monsoons. According to K S Sivasami, a professor at the Centre for the Study of Regional Development, Jawaharlal Nehru University ( jnu) , "Indian monsoon prediction is currently based on an empirical 16-parameter model which the imd has been successfully using since 1988 to predict monsoons. If we analyse monsoon rainfall data since 1951 onwards, it is clearly seen that there is no direct relation between El Nio and the Indian monsoon. There are many years in the past when El Nio has occurred, but India has witnessed good monsoons. Some scientists acknowledge that there is something wanting with monsoon prediction in India. "Monsoon prediction in India is still at an empirical stage. Widespread droughts occur due to fluctuations in the monsoon. If the good monsoon period is longer, the subsequent decade may face drought," says Sivasami. This means the drought may occur over large areas. It is mainly due to the fluctuation of monsoon and El Nio may be one of the factors. But in what way it is linked is still unknown. Moreover, it is still difficult to predict what will happen in the entire monsoon season and definitely not day-to-day or region-to-region variations. Till then India has to wait. If El Nio strikes, the government machinery will be caught napping and the worst hit will be the people. Written by S S Jeevan with inputs from Jitendra Verma and Richard Mahapatra.